It's definitely a good sign if your little guy loves Buzz Lightyear. Buzz has so many admirable qualities. Not only is he gifted when it comes to falling with style but he's also a great friend. Sure, at first he was at odds with Sheriff Woody when they first met but the confident space ranger proved to be a stand out buddy to all of Andy's toys. Buzz proved he could work together with Woody so the two of them could escape the wrath of the naughty neighborhood kid, Sid, thus showing his true colors! So if your child idolizes the popular Disney/Pixar character, embrace it! 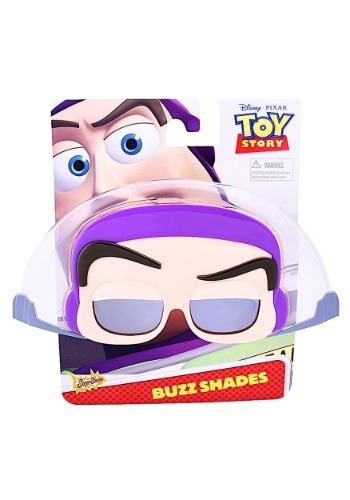 Outfit him in a Buzz Lightyear costume and top the look off with this buzz shades. The Toy Story Buzz sunglasses will disguise him in Buzz's signature helmet, while the cocked eyebrow will recreate the toy's animated expression. Pair this accessory with any boy's Buzz Lightyear costume and watch your little space ranger's eyes light up!